How California Pizza Kitchen managed to turn lettuce wraps filled with lean protein into a nutritional nightmare is almost more than we can fathom. Good thing we've made 'em over... DIG IN! In a medium bowl, thoroughly mix soy sauce, sugar, garlic, and ginger. Add chicken, shrimp, water chestnuts, and sauce mixture. Cook and stir until mixture is hot, about 2 minutes. Remove from heat, and stir in sesame oil and scallions. 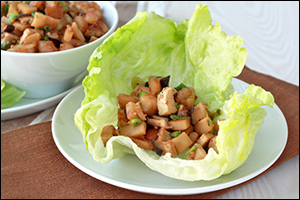 Let cool slightly, and then distribute among lettuce leaves! Time out, CPK. You're not playing fair. We're going about our lives, trying to make smart food choices, and just when we think we've found something promising, you hit us with a big ol' FOOD FAKER. 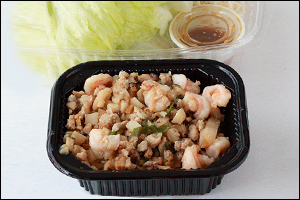 Lettuce wraps filled with chicken and shrimp? Surely a light option -- why not order the appetizer platter for yourself as an entrée, right? WRONG. We hate to be a buzzkill, but this app plate has more calories than CPK's Belgian Chocolate Soufflé Cake and nearly three dozen fat grams. It's not the worst thing on the menu, but it's still way heavier than it should be. How does something like this happen? One word: OIL. The filling for these wraps is incredibly oily. There's also a sauce on the side, which seems rather unnecessary, since said sauce tastes much like the marinade already used in the filling. No amount of lettuce can save this dish, so we made it over. Ditch the excess oil, skip the silly sauce... just use our recipe. We know how to play the game! Share it now! Click "Send to a Friend," and pass this recipe around to everyone. The second week of February means -- HOORAY! -- we're officially in the midst of the Great American Pizza Bake. Preheat that oven, and check out our recent guilt-free pizza recipes!